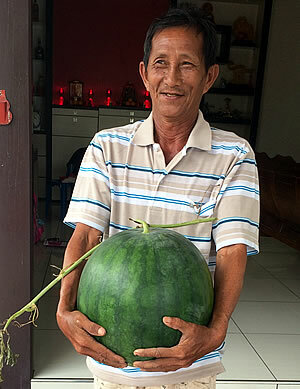 The application of Polysulphate in a fertilizer experiment with watermelons in Malaysia has produced noticeably better crop growth and increased yield by a third compared with control plots. Watermelon is easy to prepare and enjoy but is a demanding crop for soil to sustain. For the creeping plant to thrive, flower and subsequently swell the fruits to the perfect size for harvest it needs optimum nutrition. Without continued release of key nutrients it will not be able to sustain the vigorous growth of stem and leaves to develop into a plant perfectly poised to photosynthesise the sun’s energy for fruit formation. In a trial in on sandy loam soil in Kahang, Johor province, Malaysia fertilizer practice was put on trial. 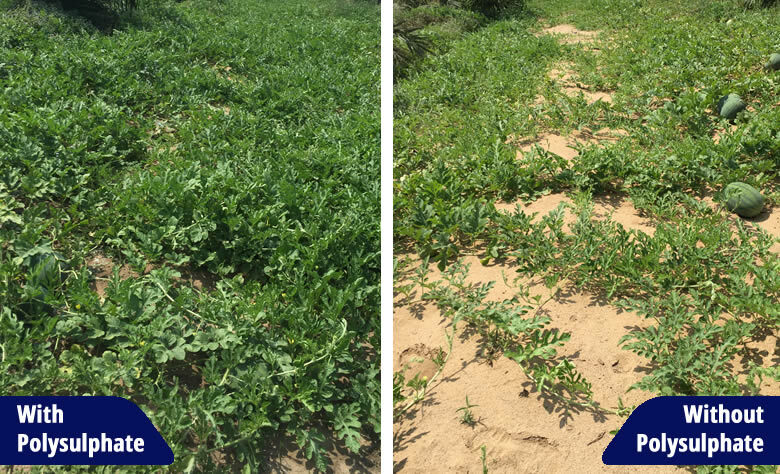 Standard fertilizer practice - applying compound fertilizers 600kg/ha - was compared with combining that same rate of compound fertilizer with an application (top dressing before transplanting) of 100kg/ha of granular Polysulphate to the watermelon crop. It was observed that in early growth stages the Polysulphate plot plants showed minimum mortality or root fungus infection, and plants grew greener and faster. Using Polysulphate provided a prolonged availability of potassium, calcium and magnesium which strengthened the plants. The magnesium improved light absorption and rate of photosynthesis. A considerable time after application, granules of fertilizer were still visible in the soil showing that it dissolves gradually and releases the nutrients steadily for uptake by the crop. At harvest, the control plot yielded 90mt whereas from the Polysulphate plot of the same size 120mt of watermelons were produced, a 33% yield increase. The fruit were observed to be bigger and are expected to be of better quality with improved shelf life. A new level of experimentation is now being planned in Malaysia to investigate increasing the dosage of Polysulphate with watermelons.